The resource of choice for pediatric residencies, clerkships, and exams, this renowned Pediatric text continues to provide a focused overview of the core knowledge in the subject. Succinct, targeted coverage of normal childhood growth and development, as well as the diagnosis, management, and prevention of common pediatric diseases and disorders, make this an ideal medical reference book for students, pediatric residents, nurse practitioners, and physician assistants. 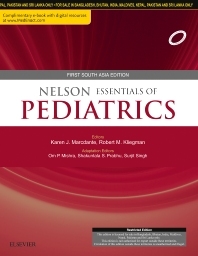 • Efficiently review essential, concise pediatric content with this popular extension of the Nelson Textbook of Pediatrics. • Focus on the core knowledge needed for your pediatric rotation with coverage that follows the MCI curriculum guidelines. • Easily visualize complex aspects with full-color layout and images, as well as numerous tables throughout the text. • Accomplish the learning with four new Sections – Community Pediatrics, Pediatric Surgery, Ophthalmology and Otorhinolaryngology. • Enjoy complimentary access to enhanced e-book with videos and other digital resources. • Access online select decision-making algorithms from Pediatric Decision-Making Strategies by Pomeranz et al. (ISBN: 978-0-323-29854-4). Dr Shakuntala S Prabhu MD DCH FRCPCH Professor & Head Dept. Of Pediatrics and Divison of Pediatric Cardiology , Bai Jerbai Wadia Hospital for Children, Mumbai •	Experience: 21 years •	Editor –in-Chief Pediatric clinics of India 2007- till date •	Training in Fetal echocardiography at Children’s Hospital of Michigan, Detroit (2001) •	Done around 18,000 Paediatric 2D echoes and Colour Doppler and around 2000 Foetal echocardiograms •	Lead Author in 10 peer reviewed indexed journals and co-author in 58 peer review indexed journals •	Editor for two textbooks on Pediatric cardiology •	Contributed chapters in 8 books •	Given 172 presentations and guest lectures in various national and international conferences •	Participated in around 44 Clinical Research Projects & Guided Post graduate students . • Member of Technical Expert Groups/Advisory Groups: UPSC, ICMR, ART, Juvenile Rheumatoid Arthritis, Indian Rheumatology Association. Dr Surjit Singh; MD; DCH (Lon. ); FRCP (Lon. ); FRCPCH (Lon. ); FAMS Fellowship in Pediatric Immunology (Lon. ); FIAP; FICAAI Professor of Pediatrics Pediatric Allergy Immunology Unit, Advanced Pediatrics Centre, Post Graduate Institute of Medical Education and Research (PGIMER), Chandigarh •	Experience: 25 years of experience •	Publications in peer-reviewed journals (230) •	Chapters in Books: 76 •	Published a book on ‘Pediatric Rheumatology, 2/e’	•	Research projects: 6 in PhD and 40 in MD/DM •	President, Indian Society for Primary Immune Deficiency (2013-2014) •	President of Rheumatology Group of Indian Academy of Pediatrics (2005 – 2006) •	Associate Editor of International Journal of Rheumatic Diseases (2014) •	Member of decision making bodies of Medical Council of India •	Member of Technical Expert Groups/Advisory Groups: UPSC, ICMR, ART, Juvenile Rheumatoid Arthritis, Indian Rheumatology Association.